And the winner of the reader-voted 2017 Block of the Year bracket is… Philadelphia Amp’s Anna Thompson! With a block that appeals both to those who primarily care about the athletic and aesthetic appeal of a bid and those who think the context and importance of the defensive play matters, Thompson’s massive layout to save Amp’s season1 on double game point of the mixed Club Championship final is a deserving winner. In case the feat itself wasn’t impressive enough, just take a gander at the list of names Thompson knocked off on her way to victory: Jorgensen, Shofner, Cardenas, Ing. These are some of the most exciting and accomplished athletes in the sport. There’s no doubt Thompson truly belongs among them. Congratulations Anna, and thanks to all who participated in our Block of the Year bracket voting! 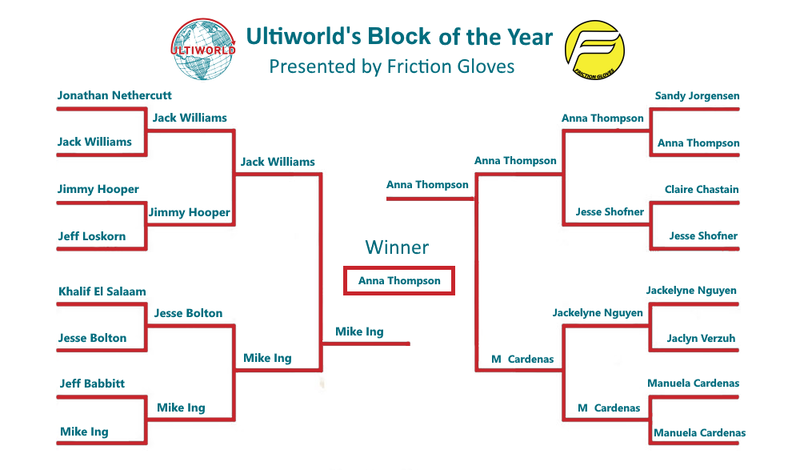 Comments on "Ultiworld’s 2017 Block Of The Year: Anna Thompson, Presented By Friction Gloves"